TL:DR: The Moments of Life (Families) app was launched on 29 June 2018. It currently caters to the needs of new parents and those with children under six years old. Read on to find out how the app can help you ease the transition to parenthood and support your child’s development. Of the many milestones in life, the birth of a child is arguably the most momentous. For new parents, it is a time of great joy, but also a trying period as they adjust to having a tiny human in their care. To smoothen the transition to parenthood, the Singapore government has developed the Moments of Life (MOL) (Families) app, now available for download for both iOS and Android. The app, which caters to new parents and those with children under six years of age, is the culmination of 12 months of on-the-ground surveys, interviews, prototyping and beta-testing conducted with citizens representing a wide swathe of Singapore society. The MOL (Families) app is another step towards delivering integrated services and information to citizens anywhere, and on a single platform. 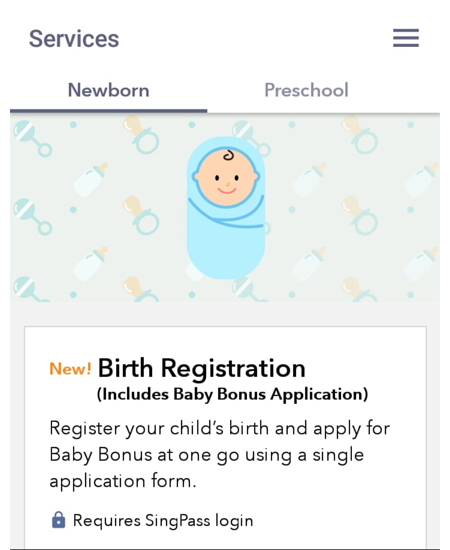 New parents, take a minute’s break from diaper duty and read on for five key features of the app you need to know about. For parents whose child was delivered in a public hospital (KK Women’s and Children’s Hospital, the Singapore General Hospital or the National University Hospital), you can now register the birth in a hassle-free manner via the MOL (Families) app. Simply log in with your SingPass and most of your personal information will already be pre-filled. This removes the need for presenting multiple physical documents when you collect your child’s birth certificate. Do note, however, that you will have to pick up the birth certificate in person, and that registration is only considered complete once the birth certificate has been collected. Under the Baby Bonus scheme, Singaporean parents are eligible for a cash gift and the opening of a Child Development Account upon the birth of their child. For parents who have successfully registered their child via the MOL (Families) app, the application for Baby Bonus is triggered automatically, thereby removing the need for a separate application process. Did you know that within the first 18 months of birth, your child needs to receive up to 23 vaccinations? Keeping track of all these doses can be a headache. 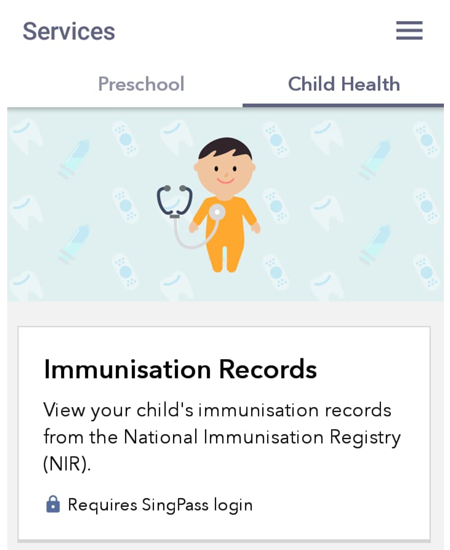 Now, with the MOL (Families) app, busy parents need not keep a manual checklist to tick off the number and type of vaccines their child has already received. Furthermore, the app also helps parents manage their child’s upcoming medical appointments, thereby reducing confusion and giving them a holistic view of their child’s health in the crucial months following childbirth. Searching for a preschool near your home just got simpler. The MOL (Families) app comes loaded with a list of preschools searchable by location. The vacancies available at each centre, as well as the enrolment fees, can be found via the app. 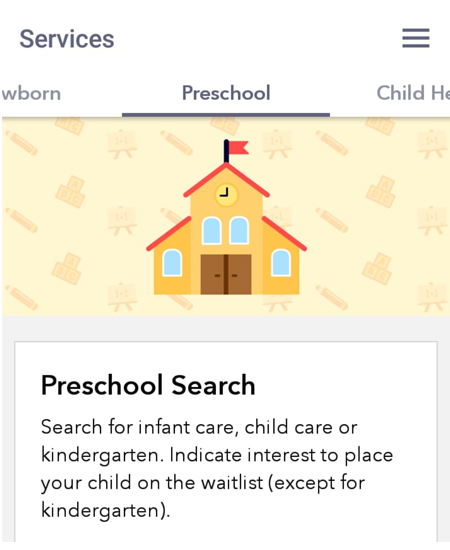 Parents can also use the app to indicate interest in sending their child to a particular preschool, though this is no guarantee of placement. Once their request is submitted, parents will be contacted directly by the preschool for further discussions. The journey of parenting can be a daunting one without the right support. With the MOL (Families) app, users can access a wealth of resources on topics relating to parenthood. 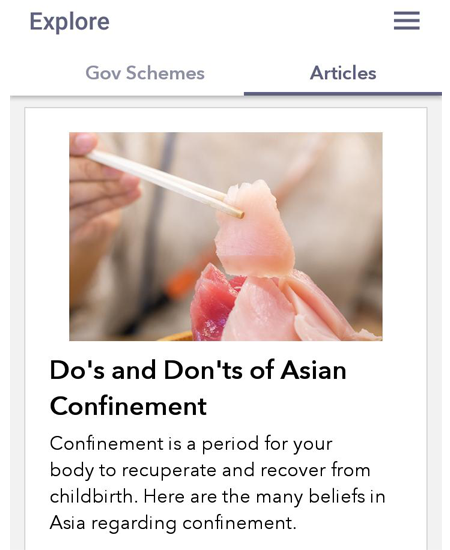 For example, the Parenting Resource section of the app contains parenting articles, videos, tips and guides for parents, all customised to the local context. Parents can also view upcoming events that are aligned with their personal interests. The MOL (Families) app will continue to be enhanced, and its scope expanded to include new features and to cater to a wider range of important life events. Any feedback on the app is appreciated and should be sent to mol_families@psd.gov.sg.